Anti-Gay Christian YouTube Star: God Has Forgiven Me For Trying To Cheat With An Ashley Madison Account [VIDEO] - Joe.My.God. If you’ve been on the internet the past few weeks, you may know of the Terrell, Texas, couple’s pregnancy announcement. The viral video featured Sam sneaking a sample of his wife’s urine, performing a pregnancy test, and breaking the news to Nia she was pregnant. The husband told the wife! What a novel twist! Then things got sad. Three days later, the couple announced that Nia had miscarried in a video titled “Our Baby Had A Hearbeat,” garnering sympathy from strangers around the world. Then things got weird. A few days later, Buzzfeed reported that the entire viral sensation was staged. According to doctors who spoke with the site, an accurate positive result was unlikely given the fact the test used diluted urine. The Raders admitted the pregnancy was never confirmed by a doctor. Then things got sad again, but in a different way. The couple responded to the allegations and claimed that the entire hoax (and it was a hoax) was staged by God. The two claimed they were being persecuted for their Christian faith because their quest for internet fame quickly backlashed. The Raders’ victim complex was impressive. Rader and his wife, whose fidelity and devotion are a lynchpin to their online persona, deleted a video earlier this summer titled “Kids Reacts to Gay Marriage.” According to Buzzfeed, the video showed the couple trying to coax a negative response on gay marriage from their 5-year-old daughter after she said gay couples should be able to get married if they want to. The Raders reportedly make into the mid-six figures from their YouTube channel. Christ doesn’t let anyone down, which is why we are called to put our identity in Him and nothing and nobody else. 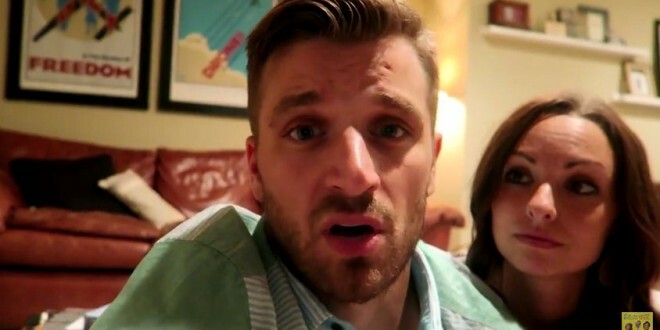 My wife and I plan to move forward as normal with our vlog, as we will not allow Satan any foothold in our lives. I have no doubts that we will continue to be attacked and shamed as we live our lives for Jesus in the public eye. It’s the reality of our humanness. You won’t see or witness any perfection from my family and especially not from myself. I hope you are praying for one another and you pray for me. I do not plan to comment or say anything else about this situation. I am very sorry for my actions and regret it immensely. Our family would like to move on despite the hatred and criticism that will certainly ensue. Thank you for listening and thank you for your understanding and forgiveness in this matter.